Several months ago I discovered a picture of a headstone listing one of my relatives as a Brig. Gen. in the Civil War. This headstone was originally placed in Columbia, TN in 1864/1865 stating "H.B. 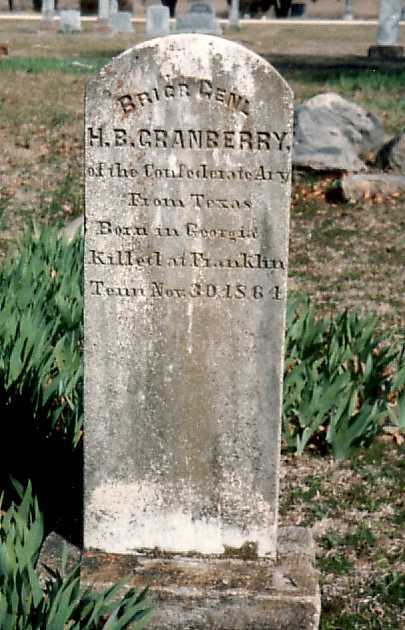 Granberry of the Confederate Army, From Texas, born in Georgia, Killed at Franklin, Tenn. Nov. 30, 1864". Through further research I discovered the town of Granbury, Texas was named for this same soldier. The Granbury Depot stated this soldier was the son of Norvell R. Granberry and he was born 1831 in Mississippi. Finding such conflicting data I could only assume the state of Texas had the wrong man buried in the town cemetery. The search was on to find the proof as to which soldier really should be honored as a Civil War hero. I still wanted to find a bit more proof. With the help of several new friends the gravesite of Fannie Sims, wife of Brig. Gen. Hiram B. Granbury was located. We also located new information as to his imprisonment, parole, and prisoner exchange. The following genealogy report will give the family line, sources, and military history of Hiram B. Granbury born in Mississippi. Please note the "military history" was taken from copyrighted sources, this is not my work. I am deeply grateful for the privilege of sharing this work with other researchers. Please keep in mind genealogy is never finished. More and more individuals are sharing their family history, I hope someone connects with this small bit of data. A very special thank-you to Becky and Jim Drake who have allowed this work to link with their Civil War articles. Jane Embrose, a 3rd cousin 3 times removed to Brigadier General Hiram B. Granbury, was born in Mississippi but now lives in Ohio. Jane's connection to the Granberry family is through the union between Moses Granberry and Elizabeth Dulaney Powell, second marriages for both. Their daughter, Martha Jane Granberry, married Ezekiel Stafford Travis. Moses Granberry is Jane's 4th great grandfather. George Granberry, brother to Moses, is the great grandfather of Brigadier General Hiram B. Granbury. Moses Granberry, George Granberry, and Sarah Granberry were the children of James Granberry and Mary Manning.